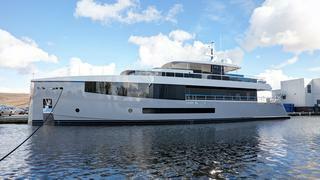 Feadship has launched the 33.5 metre Hull 692, the first of five similar, compact superyachts. The five innovative yachts contain a record amount of glass, as well as other features normally seen on much larger yachts. Each of the yachts has a custom layout, with Bannenberg & Rowell responsible for the interior of Hull 692. The idea for the compact 34 metre cruiser was born when Feadship was approached by the owner of a custom Feadship who was looking for a smaller yacht, but built to Feadship standards. “We don’t like saying no to clients at Feadship so we decided to explore whether it was even practical to design and construct a 34-metre cruiser to Feadship quality within the boundaries of this compact size,” said Feadship CEO Henk de Vries. Feadship research proved that it would be possible, but only if the Dutch builder constructed three to the same design template. “Turning normal market dynamics on their head, we therefore agreed to our client’s proposal as long as he could introduce two more clients who would like to order one of these unique Feadships,” explained de Vries. It didn't take long for this approach to pay off and since the initial order for three compact Feadships, the Dutch yard has received two more orders from other clients. Feadship’s in-house designers, De Voogt Naval Architects, developed the 34 metre yacht design with unrestricted ocean going capabilities. 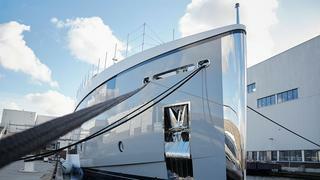 The design features the largest amount of glass as a proportion of the exterior profile ever seen on a Feadship. The ceiling height of 2.45 metres in the main deck saloon and dining area is also unparalleled. The interior of Hull 692 is laid out with an owner’s stateroom on the main deck and cabins for a further eight guests in four cabins on the lower deck. There is also accommodation for six crew. A top speed of 19 knots can be achieved courtesy of the twin MTU 16V2000 M93 main engines. Feadship 692 is also equipped to carry a 5.6 metre custom tender and a wave rider jet ski. Hull 691 and Hull 693 are under construction and will be launched in the near future, while the last two compact Feadships are scheduled for delivery in 2017. The 34 metre design is one of the smaller designs to be delivered by Feadship in recent years, but last year it also delivered its largest ever yacht, Symphony. 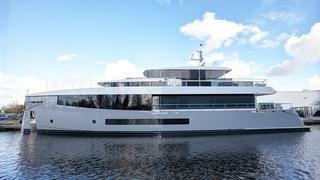 The 66.25 metre Vanish was the first Feadship to be launched in 2016. Meanwhile, the 96 metre Project 1006 is one of a number of other projects on order.